The time difference between Vienna and London is only an hour, but still I had to make sure at least three times that I had really converted 10.15 (GMT) into the appropriate time here “on the continent”. 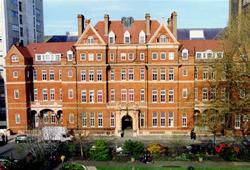 The picture above is of the Leonard Wolfson Experimental Neurology Centre in London; it is part of UCL and closely affiliated with the National Hospital for Neurology and Neurosurgery. The PhD interview I was invited to attend for the Wolfson Centre had to be conducted via Skype since I had already flown home, and it was a significantly different experience from the first interviews I had had two weeks previously. Firstly, the interview panel this time consisted of five group leaders (compared to four), including Nicholas Wood, the professor who runs the programme, Anthony Schapira, the head of the Department of Clinical Neurosciences, and Linda Greensmith, a professor of neuroscience who researches motor neuron disorders. Secondly, since the Skype connection was not perfect it was extremely difficult to see all of them at once, let alone discern their facial expressions. I certainly did not manage to make them laugh once during the 15-minute grilling. Thirdly, and possibly most importantly, there was no paper we had to read beforehand or any presentation we needed to give. This, combined with the fact that I know almost nothing about neuroscience, caused me to be a lot less sure of my abilities. Fourthly, some of the questions they asked were really quite hard. Apart from the more obvious, “Why do you want to join this programme?”, there was also, “What do you think is the role of industry in science?”. To answer the latter question I rambled on a bit about pharmaceutical companies and cancer combination therapies, which is probably not what they really wanted to hear. And then there was also, “What do you consider the most important advancement in biology in the last ten years?”. Luckily, this is something I had thought about during the course of exam preparations in previous years, and so I answered “fluorescent proteins” with quite some confidence and then went on to say that I didn’t think I’d recently read a molecular/cell biology paper that did not utilise fluorescent proteins. Lastly, they understandably also wanted to know what field of neuroscience/neurodegenerative disease research I was particularly interested in. Given that I have never taken a dedicated neuroscience course this was particularly tricky to answer. Thankfully, a lot of the group leaders’ research at UCL focuses on various aspects of mitochondrial (dys)function and so I tried to argue that it would be interesting to find out more about the differences and similarities between mitochondrial functions in various neurodegenerative disorders, such as Parkinson’s and Alzheimer’s diseases. Don’t ask me how, but I managed to convince them to let me visit the institute in January so that we can have a proper conversation and more in-depth discussion of the available research projects. 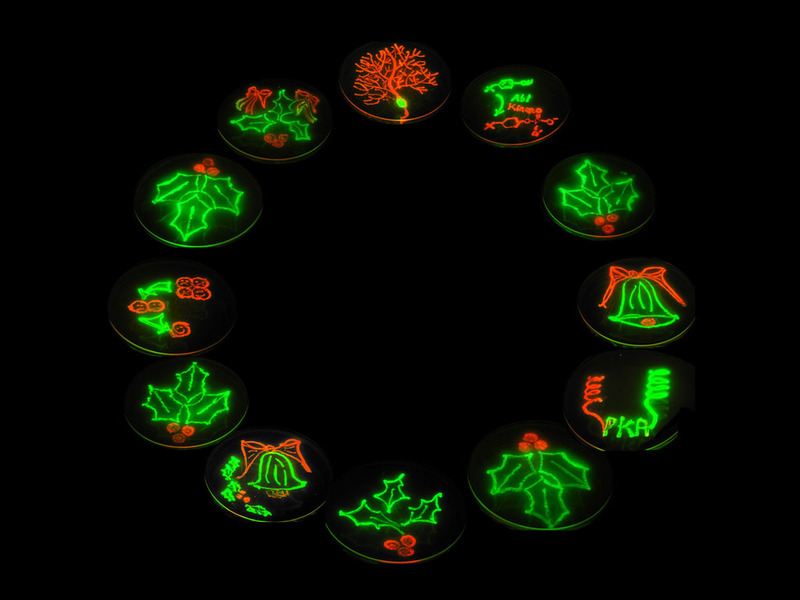 To end on a festive and fluorescent note, here is a picture (taken from the website of Roger Tsien’s lab) of glowing bacteria producing red and green proteins – merry Christmas! This entry was posted in Opinion, PhD, PhD Applications and tagged application, biology, Christmas, neurodegenerative diseases, neuroscience, PhD, Science by Victoria Wang. Bookmark the permalink.